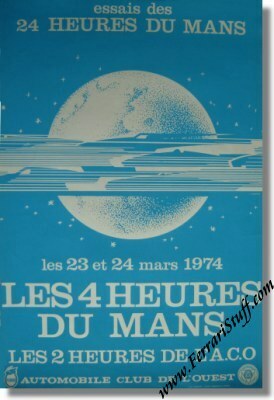 Vintage 1974 24 Heures du Mans Qualifying Poster. This poster for the 1974 qualifying / tests is a mono tone version of the poster for the actual race. The race itself was won by Henri Pescarolo & Gerard Larousse in their # 7 Matra-Simca MS670C (S/N B-06) with a total of 338 laps to their name. For the full results of this race, please the 1974 24 Heures du Mans Competitors & Results.